In the opening scenes of Crown and Anchor, you think you’ve seen this story before. Officer James Downey (Michael Rowe) loses his temper on a domestic abuser. Small-time criminal Danny (Matt Wells) reveals himself to be in way over his head with Charlie the local crime lord (Ben Cotton), then immediately proves how bad he is at crime. Both protagonists sport an anchor tattoo on their neck, so their destinies must be linked. But this isn’t a film about criminals, though they play a part. Crown and Anchor wants to dig deeper, into the aftermath of violence, and the consequences of a family unable to confront it. James’ mother has passed away, and he’s not welcome at the funeral, while being castigated for not showing up. Yet he has to take care of the estate, so he’s stuck both literally and metaphorically in the boonies, an outsider to almost everyone, especially Danny. These two are bound by family, and writer/director Andrew Rowe lets the secret out slowly — in drips and drabs, the awful jokes people make, and the things they’re clearly not saying. Yet they all say a lot, and that’s the strength and weakness of this film. Instead of action, long stretches of the film are devoted to monologues and exchanges that take their time getting to the point. For what Rowe wants to do, it makes sense, but occasionally it defuses the tension he’s built. There’s a time bomb heading for confrontation between James and the local crime lord, but people spend a lot of time reminiscing about what an earlier generation would have done. Both Rowes are great at building character — in every shot he appears in, James is tightly coiled, even when allegedly at rest. He plays punk rock every chance he gets, and eventually that echoes with Charlie. Danny is a drunken coked-up mess, rootless and scattered. In another movie, he might be comedic, but here, Danny needs James for a shot at focusing his life. It’s clear this is a script for actors — long-time character actor Stephen McHattie has a long back-and-forth with Rowe for over ten minutes, unraveling more of the past but more importantly getting a good actors’ showcase. It’s almost not fair that Michael Rowe has to be so wound — he has very few opportunities to show range. 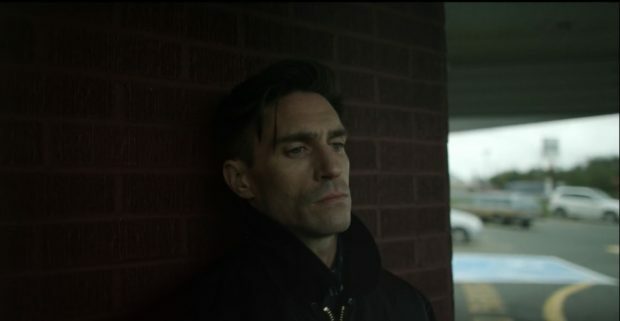 But as his roles as Deadshot in the Arrowverse and Ninjak for Valiant have proven, he’s good at being compellingly stoic. Don’t be fooled into thinking this is another crime drama; it’s more family melodrama with violent consequences. Crown and Anchor is worth a look, but it provides few visceral thrills. Instead, it may poke at conceptions of masculinity, and the damage that it can do.